This week I made an awful discovery on Bigsby: flea poop. Off to the vet we went (he had to be checked out for some other things as well) and now I’ve got all the fixin’s to kill those wretched things. I’m pretty sure they came in with the bunny, so he will be treated as well. 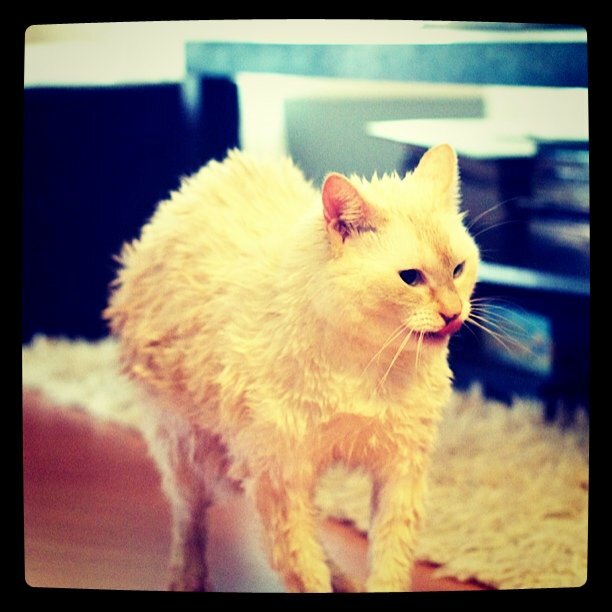 But just to be safe, I gave Bigsby a bath today before he got his medicine (and to get all the flea poop off of him). I think he thought I was trying to kill him. Not a fan of water, he is. This entry was posted on Thursday, October 14th, 2010 at 1:19 pmand is filed under 365, Bigsby, Bunnies, cleaning. You can follow any responses to this entry through the RSS 2.0 feed. You can leave a response, or trackback from your own site. I'm sure he'll find a way to get you back. If having flea poop to begin with was not already punishment enough.